Nah, we’re not going to start offering “LSD & Yoga” classes at 8 Limbs, this isn’t that kind of April 1 email, but we do have our own take on Timothy Leary’s famous motto that we’re rolling with this month. In yoga, we are learning to turn on our awareness of habitual patterns of thought and action to meet life and people consciously. At 8 Limbs, we are turning on some tech upgrades that will make it easier for our front desk staff (Studio Managers and Yoga Advisors) to communicate with you in a personal way. In the coming weeks you may hear from us in a different email format, and by text. Is there something in your life that could benefit from a little tune-up? Time to get that bike ready for spring and summer? Ready to dust off those guitar strings for a campfire sing-along? 8 Limbs has been in business for over 22 years and we’re due for our next tune-up! Throughout 2019 we’ll continue to refine our business to improve the experience for our customers and to support our teachers so that they can keep offering the amazing yoga that keeps you grounded, strong, vital, and energized. Like the Yoga Tune-up® Balls get into the nitty gritty of our muscles, tendons, and joints, we are getting into the nitty gritty of how we interface with you – our offerings, communications, and our tuition, to flush out what’s not needed and come out refreshed and more relevant. All this to make it easier for you to…. We all live in a busy city with lots to do and see. 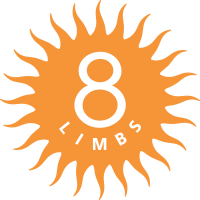 8 Limbs was built on a flexible yoga schedule that allows you to come when it’s convenient for you. We call that “drop-in,” as in, come-when-you-can, no commitment required. As the landscape of yoga classes has changed, many yoga practitioners are accustomed to reserving classes in advance, and we’re finally adding online registration to our options. Not into it? No problem. But if this is a feature you enjoy (commitment can be so helpful! ), we’re turning that on too! And our super convenient auto-pay membership is now only a 3-month minimum, rather than 6 or 12-months as in the past. Drop in is also an invitation, to drop into your body, and your breath, and this amazing practice of yoga. What helps you to drop in? This month, what will you turn on, tune up, and drop in to? P.S. This photo of Chiara Guerrieri and I was taken in Khajuraho, India, in 2016. Join us this weekend for our Breitenbush Hot Spring Retreat!